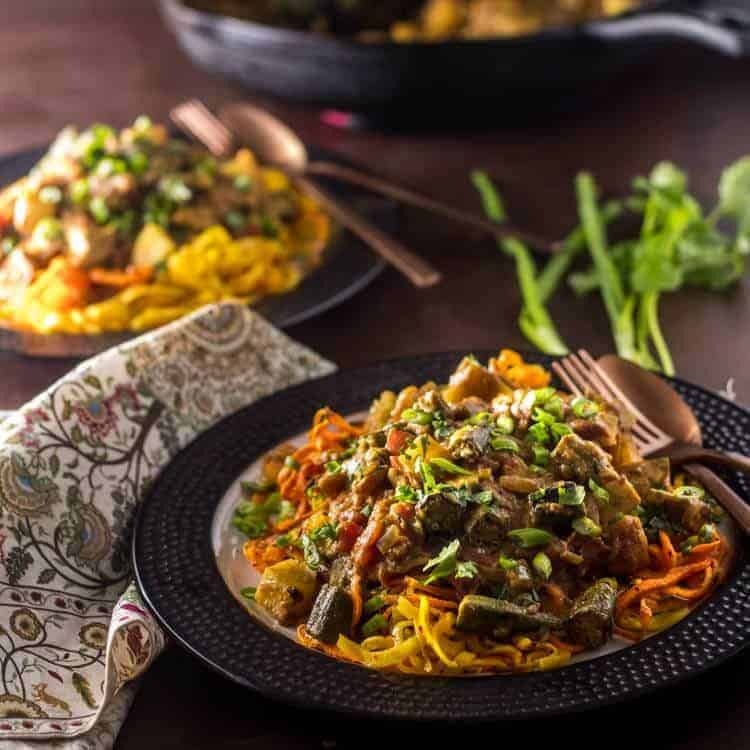 Creamy, spicy, savory, with a touch of sweetness, Low Carb Groundnut Stew with Chicken and Spiralized Sweet Potatoes hits the flavor notes of a traditional West African groundnut stew in a less traditional fashion. 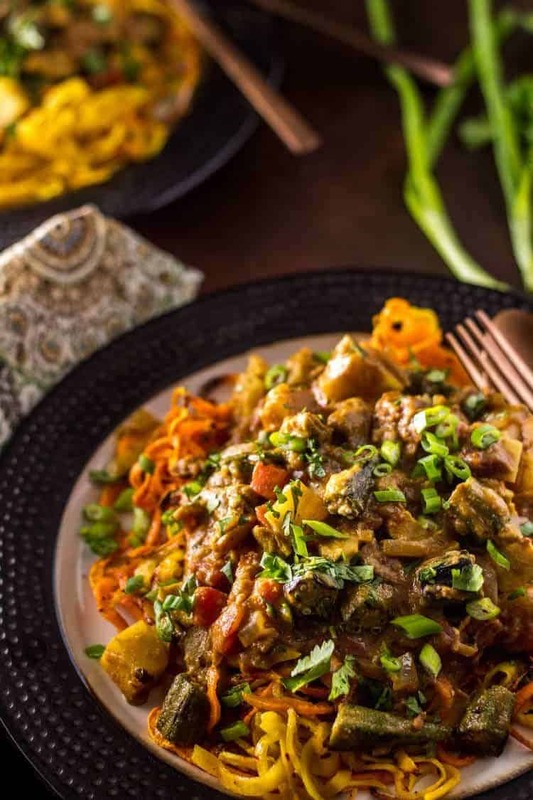 Spiralized sweet potatoes make a perfect base for this healthy, flavorful stew, and it can be on your table in less than 45 minutes! I often recall this favorite story we read to our boys when they were little, and as I worked on this recipe I remembered it with fondness once again. People use yams and interchangeably, but they are two different vegetables! What is the difference between yams and sweet potatoes, and why does it matter? Most grocery stores in the U.S. offer two similar-looking varieties of tubers, and they’re frequently labeled “sweet potatoes” and “yams.” You might be surprised to find out they’re in all likelihood both sweet potatoes. Yams are native to Africa and Asia, with the majority coming from Africa. They’re not widely available in this country. You may find them in specialty international markets in large metropolitan areas. Yams and sweet potatoes are both tuberous root vegetables, but they are not related, and are really not all that similar. In the typical U.S. market, you will find different varieties of sweet potatoes, and probably no yams. 🙁 See more on sweet potatoes. This stew is gluten free, dairy free, and relatively low carb. Sweet potatoes do have carbs, but they contain fewer per serving than standard white (or even brown) rice, and their fiber content is higher. 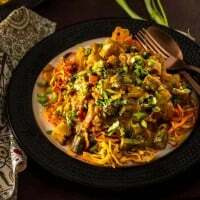 So, let’s get back to my Low Carb Groundnut Stew with Chicken and Spiralized Sweet Potatoes… This dish evolved over 25 years, and its earliest form originated on the pages of Sundays at the Moosewood – a favorite mainly vegetarian cookbook published by the Moosewood Restaurant in Ithaca, New York. 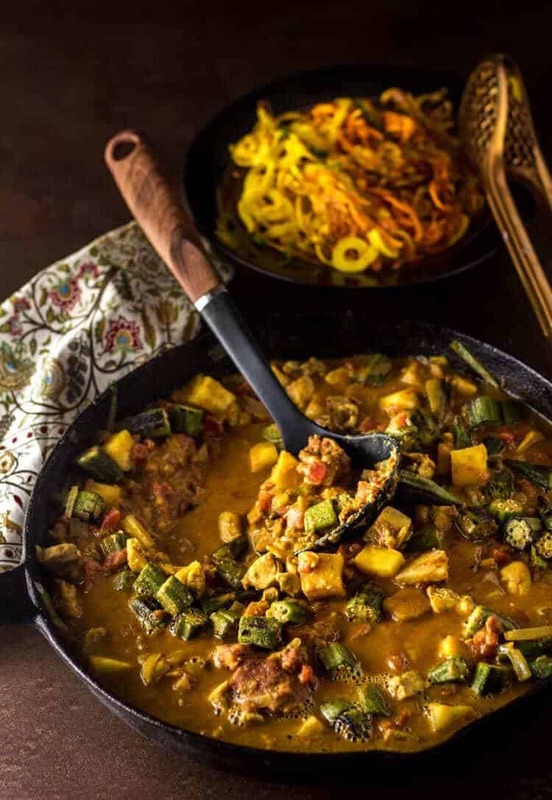 Africans refer to this dish as a groundnut stew, and like many other dishes that exemplify a cuisine, it exists in as many forms as there are cooks preparing it. The key ingredient is ground nuts – ie. peanut butter. We prefer it very thick, but many cooks prefer it more like a soup. It is really a matter of personal preference. I chose to serve the groundnut stew with spiralized sweet potatoes as we’re cutting down on carbs after holiday excesses. Africans may serve it over rice or another starch such as mashed sweet potatoes or fufu (a starch made with a combination of plantains and cassava). I tried a sauté on the sweet potatoes first, but we love the crispy edges that resulted in roasting them. The choice is yours! I’m curious… Would you consider trying this dish, or is the lack of familiarity (or the peanut butter) giving you pause? I’d love to hear from you! Preheat oven to 400 degrees (375 convection). Toss the spiralized sweet potatoes with olive oil, salt, and pepper. Cook until some of the edges are browned, and sweet potatoes are tender but not soft. (15-20 minutes). Add 1 tablespoon of the oil to a heavy pot or dutch oven. Bring to high heat. Add okra. Cook and stir over very high heat until some of the edges are blackened, and gooey substance is less present. Place in a prep bowl until needed. Add remaining oil to the pot or dutch oven. Bring to medium-high heat. Add chicken. Cook, stirring occasionally, until chicken edges are beginning to brown. Add onion, ginger, and garlic. Adjust heat to keep from burning garlic and ginger. 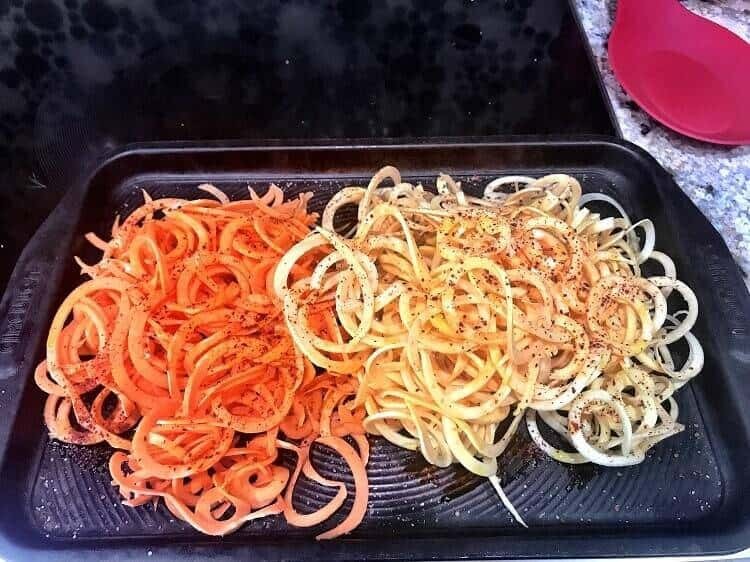 Saute until onions are translucent. Add coriander, cumin, turmeric, cinnamon, and cayenne. Cook an additional 1-2 minutes stirring occasionally with a wooden spoon. Add tomatoes. Whisk broth/stock, juice, and peanut butter until smooth. Add to the pot along with the prepared okra. Cover. Lower heat. Simmer gently, stirring occasionally, about 15 minutes to allow flavors to combine. To Serve: Using tongs, plate the spiralized sweet potatoes. Add a generous ladle or two of the groundnut stew. Garnish as desired. See notes for additional information. I really prefer boneless, skinless thighs in this dish, but breast will certainly work too. Cayenne adds the heat in this dish. Start conservatively, and add additional cayenne if desired. You can also substitute with crushed red pepper or a couple of dried chile de arbol (toss them in with the sauce and remove prior to serving). As explained in the post, we really don't see yams in U.S. markets, but you can use either yams or sweet potatoes in this dish. 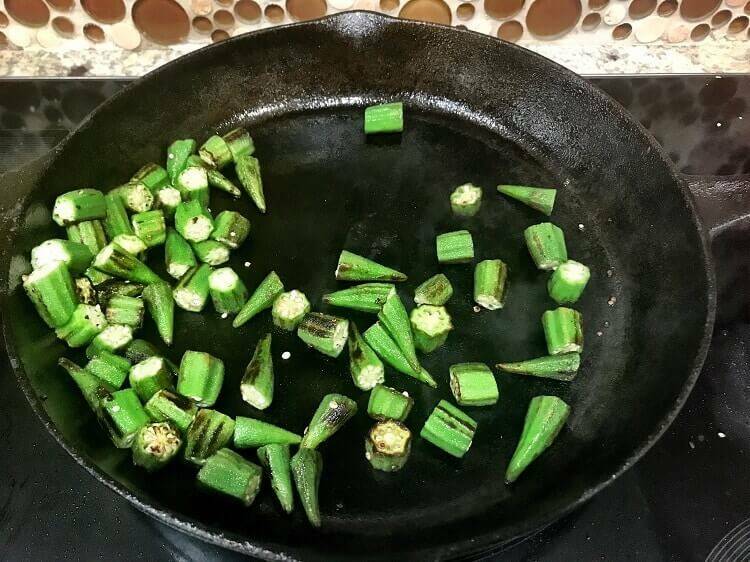 Fresh okra is amazing when you can get it! You can substitute frozen with good results. Skip the charring step adding with the tomatoes. This dish is versatile. Add meat (lamb, beef, pork) or poultry, or make it vegetarian. Chick peas are a great addition if you choose to do it vegetarian. Use fresh and seasonal vegetables when possible - eggplant and squash are great additions or substitutions. The recipe includes instructions for spiralized and roasted sweet potatoes. You may prefer mashed sweet potatoes, polenta, rice, couscous, etc. The choice is yours. Macronutrients (approximation from MyFitnessPal.com as specified): 449 calories; 34 g protein; 31 g carbohydrates; 23 g fat. This is so nostalgic, I have that cookbook! Your stew looks amazing and I am game for anything sweet potatoes. I like the versatility of that tuber, spiraled, mashed, fried, baked etc. Love this recipe, thanks for sharing! Yay for the Moosewood Cookbooks! I'm with you on sweet potatoes... They're incredibly versatile and so healthy. Thanks for stopping by! This looks incredibly tasty! I can't wait to try your recipe! I hope you will Sara! This stew sounds so flavorful. I love all of the beautiful colors as well! Thank you Jenni! I tend to prefer colorful dishes; I find them so appealing. This stew is the perfect mix of sweet and savory. This is a comfort food dish everyone will love. I have found that I like a little sweetness in many of my savory dishes. I do think most people will love it (unless they're okra haters ;-) )! Love stews like this during this cold weather season! So perfect. Can't wait to try this recipe! This one is hearty and nutritious... I hope you give it a try! I love dishes that bring sweet and savory components into the mix. The sweet fruit juice broth and spices sound fantastic! Thanks for sharing! Yay for sweet and savory combinations! I find fruit and fruit juices make their way into a good many of my recipes... Thanks Analida! I love the Moosewood cookbook. I haven't thought about that in years! This stew looks so delicious! What a fabulous combination of flavors!! Especially the peanut butter!! I can't wait to make this and serve it to hubby! He's going to love it! Great recipe! This looks so wholesome and tasty! I can't believe it doesn't take hours to make! Thanks Carrie! It really does come together quickly! What a fantastically fragrant mix in this stew! I love how you've used spiralized sweet potatoes here. I'm always game for okra added to any dish - yum! Thanks Ashley! We love the texture (and crisp edges) of the spiralized sweet potatoes, but rice or mashed taters is certainly delicious as well! Wow....this looks and sounds delicious. YES....yams and sweet potatoes.....one or the other. Unfortunately I can only rely on the grocery store for options....most of the times they are labeled sweet potatoes. The spices in this stew sound fantastic. The spices and peanut butter make this stew something special... And yes, it bothers me that our markets don't really "get" the difference! These flavors sound incredible! I looooove sweet potatoes, too. So good! I've never had anything like this. Can't wait to try it! It's always fun to try new things! I hope you'll give it a try Kate! This stew looks so hearty! I'm intrigued by the additions of peanut butter and fruit juice. Yes! I think the Africans were on to something with this combination of sweet and savory. It really is delicious! I've always loved groundnut stew. The roasted spiralized sweet potatoes give it a really nice added dimension. All the crispy edges, right? What a great recipe. For the longest time I have been hunting a good vegetarian recipe from Africa. I have found one now. I am saving this to give it a Vegetarian try. Spices use dare so much of that Indian Curry.. beautiful color also... thanks for sharing Tammy! I have actually made this vegetarian my lovely Sonal! The chick peas are delicious! Of course you can do basmati rice with it as well... so versatile! Thanks for stoping by!